Excavations in Egypt and elsewhere have revealed huge numbers of documents that have survived thanks to the arid climate of the region. These amazing objects can tell us much about everyday life in Late Antiquity, providing us with a valuable and engaging source for the period. As a result they are of great use to the researchers here on the Visualisation project. 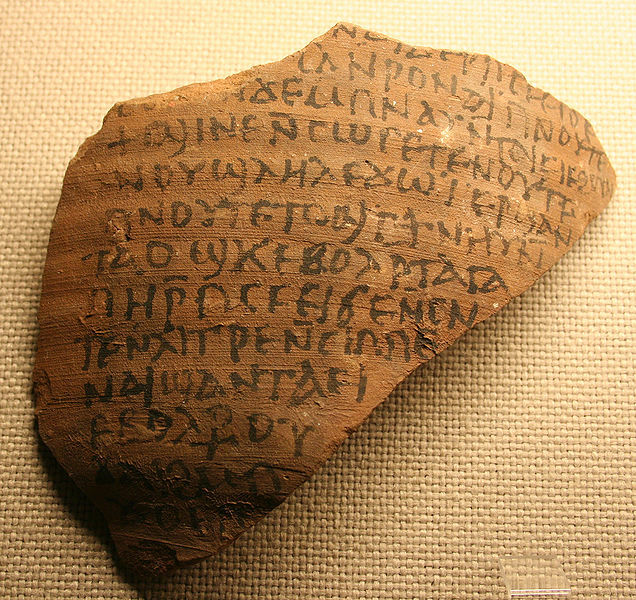 Papyrological sources are texts written on either papyrus or ostraca. Papyrus is a paper-like material made from the stems of a reed-like Papyrus plant, whilst ostraca are pot sherds or limestone flakes whose smooth surface is used to write on. The texts that they carry are either literary (for example, copies of classical texts or Biblical passages) or documentary (by which we mean texts with a practical use such as letters, contracts and inventories). The documentary texts in particular are especially useful. Their survival represents the kinds of material that is now lost from other areas of Europe, where the climatic conditions are wetter and organic material such as papyrus quickly perishes. With a few exceptions (such as the Vindolanda Tablets from the UK) these kinds of documents provide some of the best examples of everyday writing from Late Antiquity and cover a range of topics missing from literary texts. The languages used are predominantly Ancient Greek and Coptic, although Latin texts from Egypt also exist and are often associated with the Roman military. Coptic texts are especially found at the sites of early Christian monasteries, such as the Monastery of Epiphanius at Thebes. Remains of a 4th c. AD private letter to Chairemon, written on papyrus (P.Duk.inv.468). Image from papyri.info (license). This document gives us a fantastic insight directly on the possessions of someone from the late antique period. As part of his research Joe has collated a number of inventories such as this and identified the items that commonly occured together. From this data, he has created network analysis diagrams revealing the connections between different kinds of objects. 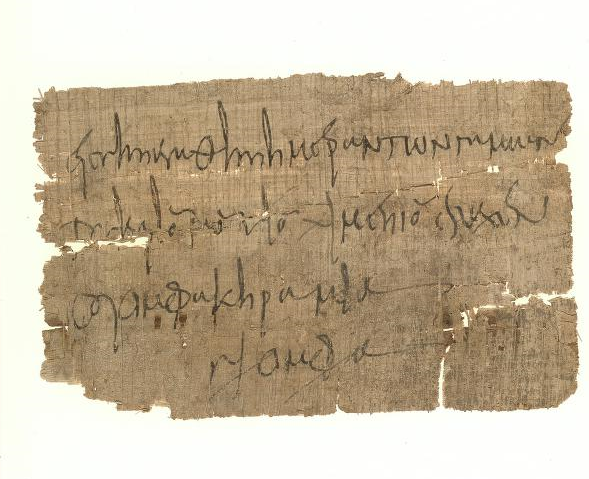 4th c. AD note accompanying a wedding gift to Limenios (SB 14.12077). Image from papyri.info (license). Whilst the gift mentioned in this text no longer exists, the note tells us exactly what it was. This kind of object – a wine flagon – might also be associated by the owner with the occasion of his wedding, when he was given it by his father. This text gives us a snapshot of an important moment in Limenios’ life and reveals the kind of object that could well have had sentimental value within the home. If you are interested in taking a look at some of the papyri from Late Antiquity, an excellent free online resource is the website papyri.info, which is a searchable database of many of the documents published to date.